In our local group (Human Rights for Iran) we have been collecting signitures for Sarkouhi's case here in Ohio for about a couple of months now. Among the signitures is an endorsement the 1996 Nobel Peace Prize winner (thanks to Dr. H. Rahmanian). Mr. Ramos-Horta writes the following on the petition form: "Jose Ramos-Horta, 1996 Nobel Peace Prize. I joined with all in the demand for an immediate end to the brutal repression and human rights abuses in Iran. 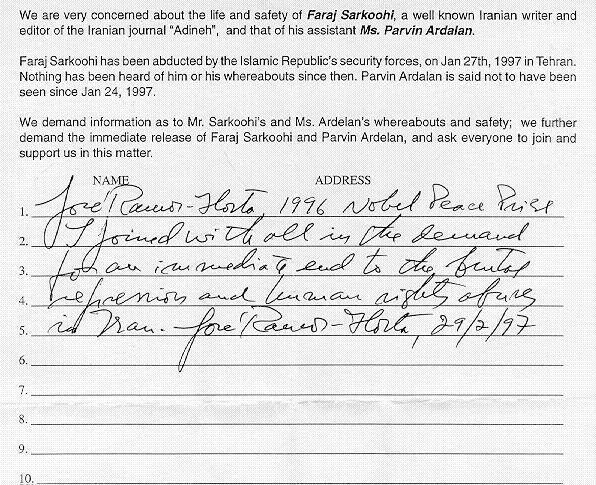 Jose Ramos-Horta, 29/2/97"
I have scanned the handwritten text on the petition form and wonder if you could put it on the web pages for Sarkoohi that you maintain. I have included the uuencoded version with this mail. Plese send your comments and suggestions to Farhad A.